HOT SPRINGS — The wire fence between Custer State Park and Wind Cave National Park has separated neighboring bison herds for decades. But now this fence has taken on new importance. Blood tests indicate that the 525 buffalo roaming Wind Cave National Park are rare — so rare that they are among only two public herds in the nation with a crucial genetic distinction: they lack evidence of cattle genes. Experts from Texas A&M University have done extensive DNA tests on more than 10,000 buffalo. The team is now confident that only two public herds — in Wind Cave and Yellowstone National Parks — lack evidence of cattle genes. “The genetics of the herd are just too important that we want to check the genetics on an annual basis,” Farrell said. Geneticists believe that all of the 500,000 buffalo alive today descended from fewer than 150 bison alive in the late 1880s. At one time, 60,000,000 bison roamed the prairies. The recovery of the bison is a great conservation success story, but DNA testing has shown that pureblood animals are surprisingly rare. The cattle ancestry in most bison today stems from ranchers' experiments when they tried to produce hybrids combining traits of buffalo and cattle. Those dabbling in “cattalo” included Fred Dupree, a rancher on the Cheyenne River Indian Reservation, who rescued five bison calves in 1882, when bison were nearly extinct. It is the offspring of Dupree's calves who are the foundation of Custer State Park. They graze on the north side of the boundary fence with the pure bison from Wind Cave National Park. The Wind Cave park herd started with 14 bison donated in 1913 by the New York Zoological Society Six more were imported from Yellowstone National Park in 1916. The herd is one of several conservation herds established through the efforts of the American Bison Society. 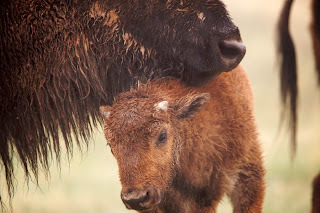 Now that the Wind Cave herd has been recognized for its lack of cattle “introgression,” the park is working with conservation groups to expand the population of bison apparently free of cattle DNA. 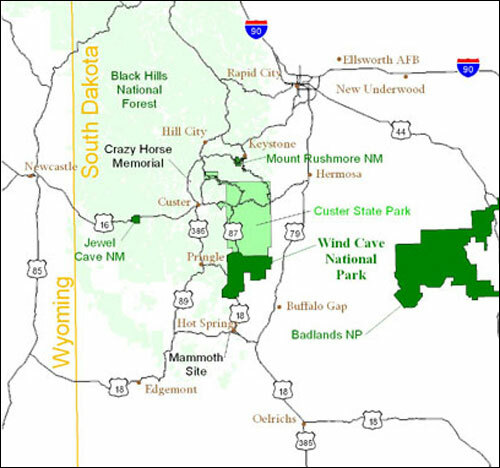 Surplus Wind Cave bison have been sent to satellite herds managed by the American Prairie Foundation and The Nature Conservancy. Both groups are working to expand the pure buffalo herds. The U.S. Department of the Interior is working with other agencies and groups in a new wave of bison conservation. Because of the scarcity of pure bison, many believe they should qualify as an endangered species.